The Libra Cart smartphone and tablet app by Agrimatics takes the guesswork out of handling and tracking your grain by allowing you to track each paddock’s yields, the weight of the truck and where the grain is to be stored. Every chaser bin load is logged by an automatic unload detector and then made available to view via the Libra Cart email button or using the Aero cloud service, which allows you to manage your data from anywhere at any time. Southern New South Wales grain producers Ray and Bev Norman have been using the Libra Cart app paired with one of Hawk Engineering’s retro-fit scales, and report that it helped to take the guesswork out of filling their trucks to comply with the Chain of Responsibility Legislation and also keep track of stored grain. "In previous years we were under filling our trucks by about 10 to 15 percent to ensure we didn’t exceed the legal limit but now with the chaser bin scales we maximise every load to within 1 to 2 percent," Bev says. "It also enabled us to easily keep records of how much grain we had stored on farm by setting up the destinations in the app, which then took the guess work out of marketing," she adds. Hawk Engineering scale kits come with load cells, an indicator, brackets, a tow hitch fasteners and installation instructions, and can be installed in a local engineering workshop or on-farm workshop. If your bin is already equipped with scales, the Libra Cart indicator can replace an existing indicator that is industry compatible with standard load cells. Complete Hawk Engineering kits start at $4900 + GST for a single axle chaser bin with a hard wired indicator, up to $10,500 + GST. If your bin already has scales the Libra Cart wireless indicator can replace your existing indicator for $2250 + GST. 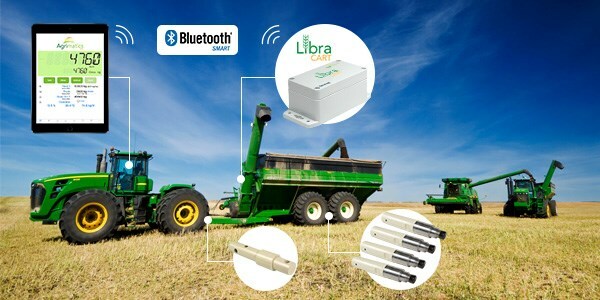 The benefits of the Libra Cart app include Bluetooth Smart connection, automatic unload detection to record every unload, accurate silo- grain bag filling, unlimited displays, such as header, chaser bin, truck and, finally, no USB sticks. It is a free download.